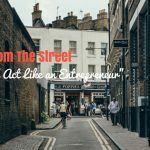 TSE 157: This Is How You Should Sell To Us! 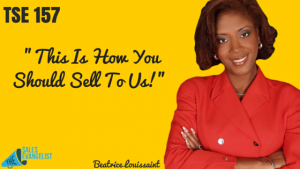 Home » TSE Podcast Post Page » TSE 157: This Is How You Should Sell To Us! We have an amazingly awesome guest on the show today. It’s Beatrice Louissaint and we’re talking about entrepreneurship and how sales professionals benefit from this. She is the President and CEO of a non-profit organization, Southern Florida Minority Supplier Development Council (SFMSDC), otherwise known as The Council, which works with large corporations helping small-mid sized businesses become successful and profitable. Beatrice has helped a lot of companies, specifically minority-based businesses such as Hispanic, Asian, African-American, and Native American companies to grow. They have been in business for 40 years helping large organizations meet their supplier diversity objectives. Below are some great principles behind how salespeople can work with entrepreneurs and some things entrepreneurs can do to better position themselves to enter new market and sell better. The council helps them by connecting them with opportunities with major corporations such as Fortune 1000 companies, governmental and educational institutions, and hospitals. Services provided: loan funds, mentor protege program, advanced management programs at 3 top universities, legal accounting, marketing, etc. Do the opposite of what everyone else is doing. Everyone has to sell. Know who your customers are. Grow from your current customers. Sometimes we get too busy chasing after the new deals that we forget to take care of what’s feeding us now. Who are your best prospects? Who’s growing that may need your widgets? 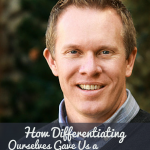 What differentiates you from competitors? Have the right mindset to sell. Have a clear and concise vision. Dream BIG. Create a business plan, not only for new businesses but also for your current customers. What are you going to do to work with them? How much do you know about their business and how much are you going to help them grow? Take care of those who take care of you! Put out a work plan for your organization. Teaming up, even with your competitors in joint ventures, helps you become much bigger and stronger. Rethink what you’re doing. You might be in the wrong business. Find something that has growth potential. Be innovative and creative. Think outside of the box. Be sure to check the vitals of your company and where you are.